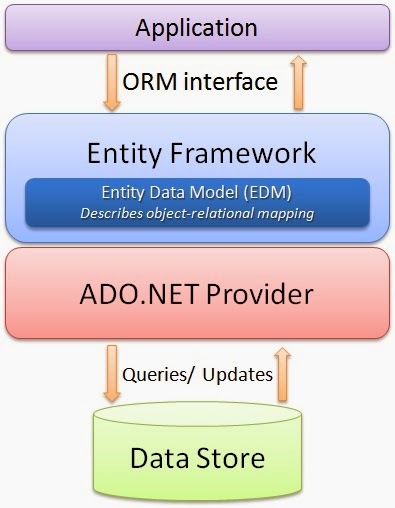 Tech Blog: What is Entity Framework ? Entity framework is an Object/Relational Mapping (O/RM) framework. It is an enhancement to ADO.NET that gives developers an automated mechanism for accessing & storing the data in the database and working with the results in addition to DataReader and DataSet. It eliminates the need for most of the data-access code that developers usually need to write. It allows you to create a model by writing code or using boxes and lines in the EF Designer. Both of these approaches can be used to target an existing database or create a new database. It also provides services like change tracking, identity resolution, lazy loading, and query translation so that developers can focus on their application-specific business logic rather than the data access fundamentals. Application : Application which is going to use Entity Framework. EDM (Entity Data Model): EDM consist three main parts- Conceptual model, Mapping and Storage model. Conceptual Model: Defines model classes and their relationships. Storage Model: It is your database design model which includes tables, views, stored procedures and their relationships and keys. Mapping: Mapping consist information about how your conceptual model is mapped to storage model. ADO.Net Provider: This layer communicates with database using standard ADO.Net. Data Store : Type of database that you are going to use. Entity Framework : How to create database using code. How to upgrade or downgrade data schema ?